The Department of Computer Science offers both software and Information Technology (IT) degrees. In software, we offer three full-time level 8 honours degree programmes and one level 7 degree programme. Level 8 programmes are 4 years in duration while level 7 programmes last for 3 years. Level 8 and 7 IT degree programmes are also offered. Please click on the following links for detailed infomation about each programme. In this modern industry-linked degree, you will study relevant up-to-date modules. The programme was designed with several module pillars. These pillars include Computer Science, Software Development and Data Science. 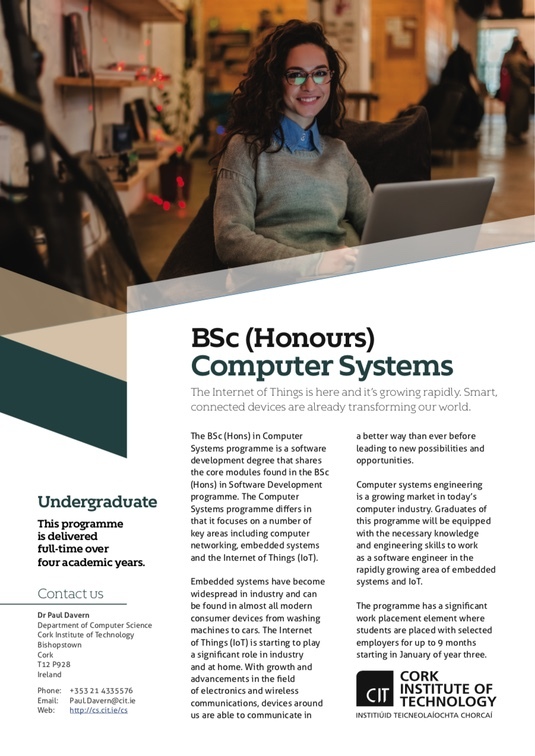 The Computer Systems programme focuses on software development, computer networking, embedded systems and the Internet of Things (IoT). Embedded systems have become widespread in industry and can be found in almost all modern consumer devices and cars. 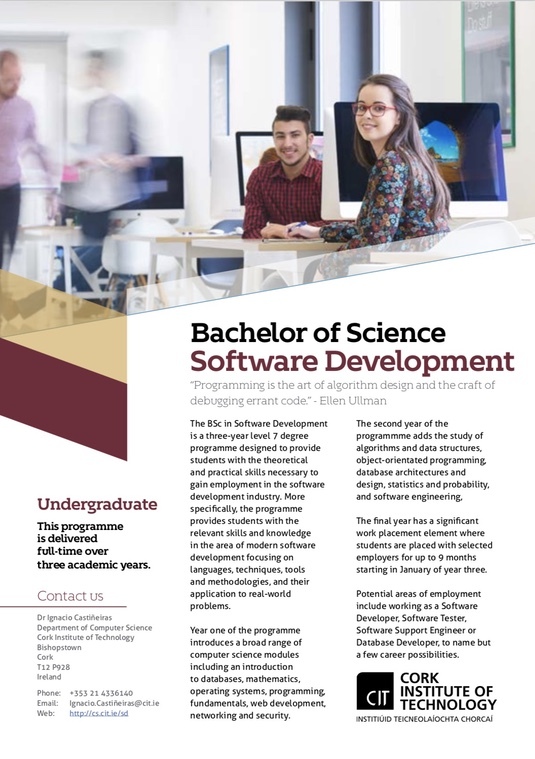 The BSc in Software Development is a three-year level 7 degree programme designed to provide students with the theoretical and practical skills necessary to gain employment in the software development industry. 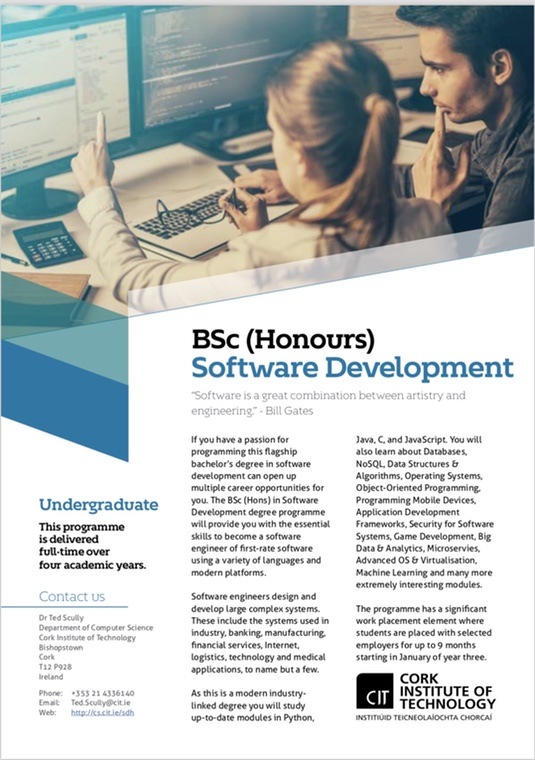 Alternatively, if you just need a quick overview of each software programme please click on one of the images below to download a pdf flyer for each programme. The flyers offer a brief introduction to each programme and include full programme schedules. The schedules have hyperlinks to every module descriptor allowing you to get to all the information that you need.